The northern lights are a jaw-dropping display of moving color. Whether seen in person or simply viewed on a TV screen, aurora borealis is incredible at every glimpse. The spectrum of colors displayed tugs on our emotions. The knowledge that what is there now will be gone in a moment keeps us eternally craving more. Though few people know of it, there is a rock that flashes those same remarkable colors: labradorite. Labradorite, at first glance, is an unassuming grey rock, originally identified in Canada in 1770. However, if it is viewed from certain angles multiple colors become visible – teal, blue, green, orange, yellow, pink. Turn the rock a bit more, and all the colors disappear. This flashing of color is called labradoressence and is quite breathtaking. When the rock was forming at high temperatures, everything was compatible. But, the lowering of the temperature resulted in a separating and layering, causing light interference. Thus, the light exiting the stone is different than the light entering. The ray of light is absorbed and refracted between the multiple layers. So, the angle of the light source, as well as the angle of the viewer, determines if a colorful spectrum is visible. That is why the colors of labradorite are so unfortunately fleeting. Some say that spectrolite, a type of labradorite only found in Finland, has an even broader and deeper range of colors. Regardless, the discovery of the stone is interesting. In 1940, while World War II was raging throughout Europe, the Finnish people were building an eastern edge defensive line between Finland and Russia. It was during this arduous excavation, that a flash of color drew the eye of a geologist’s son. Quarrying of the stone, however, could not begin until after the War ended. Moonstone is a type of feldspar that is whitish, rather than grey. The flashes of color that shine from moonstone are called the Schiller effect. If viewed from the correct angle, blazing colors of the spectrum reward the viewer. It takes a trained artisan to be able to work with these stones; the natural fractures contained within the stone create the beautiful colors, but can be difficult to navigate. However, when done correctly, the jewelry, carvings and display pieces created are mesmerizing. It’s rather wonderful to hold the northern lights in your hands, view the rainbow of remarkable colors, and then, with the slightest of movements, watch them disappear. 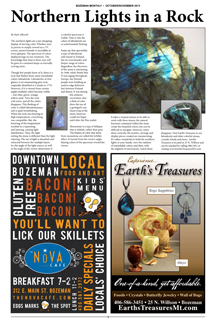 Visit Earth’s Treasures to see labradorite and other colorful stones, crystals, fossils and more.